Maison Martin Margiela will launch a new duo of fragrances for their Replica capsule line in November. At the Barber's and Tea Escape will bring the total number of scents in the series to 8. At the Barber's ~ developed by perfumer Louise Turner and inspired by her memories of her father getting ready in the morning, with basil, lavender, tonka bean and white musk. Tea Escape (shown) ~ developed by perfumer Fabrice Pellegrin and inspired by the Japanese tea ceremony, with bergamot, pink pepper, green tea, jasmine, osmanthus and puffed rice. 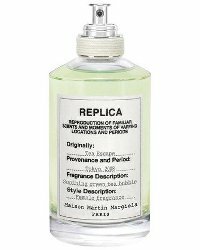 Maison Martin Margiela Replica At the Barber's and Tea Escape will be available in 100 ml Eau de Toilette.